The inspiration for this blog entry is the controversial Netflix series “13 Reasons Why”. For those who haven’t seen or heard of it, “13 Reasons Why” is the fictional story, based on a novel, of events leading to the suicide of Hannah Baker, a high school student. I am neither the parent of a teen, nor a psychiatrist who specializes in this subject, so I’ll let others make judgments on the series. From my POV as an artist, it was mostly compelling (though quite lengthy), sometimes difficult to watch, and featured strong lead performances. It led me to reflect on my own high school experience. In fact, I even whipped out my senior yearbook, and took a stroll down memory lane. I’d like to share some thoughts about my teen years. That’s me in the pic, of course, circa 19noneofyourbiz, when I was just starting high school. New contact lenses to replace my glasses, and braces to correct the tragedy my teeth had become after years of thumb sucking. I was not popular. I didn’t fit into any clique, and had few real friends. I was a loner. Prior to high school, things were a bit different. I started as a star pupil in grade school, always near the top of my class. Learning came easily to me. Taller than most, an awkward, shy but friendly kid with glasses. No athletic ability or interest in sports whatsoever. Overly sensitive. Always fearful of a negative outcome. I had more friends then, mostly girls. In fifth grade, I wrote an adaptation of a popular children’s novel, and my teacher allowed me to cast and co-direct the play, which was performed for all fifth and sixth graders. I made sure the girl I had a crush on was given the lead role, natch. The school paper featured an article about my accomplishment. I was elated. Then came junior high and puberty. Suddenly I was surrounded by tons of classmates who were as smart or smarter than I was. Once I realized I couldn’t be on top without making a concerted effort, I lost interest in academic achievement. Never regained it. I wasn’t willing to risk losing, so I stopped trying. I just read my Stephen King novels, stared out the window, and crammed for tests so I could squeak by with a C. I fell to the middle of the pack. I’m not proud of this, but that’s what happened. I gave up. Now let’s touch on the puberty part. Ugh. Tied into my choice to disconnect was a crippling lack of self-confidence in my physical appearance. 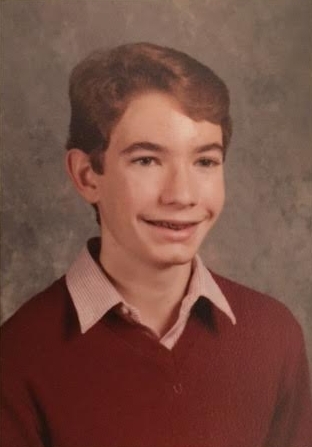 As I entered high school, I was a tall, thin, pale nobody, in my view. Acne hit me hard. I mean, hard. And unlike my eyesight and teeth, I couldn’t fix it. I could only endure. As a result, I became extremely vain and self-conscious. I assumed everyone was secretly laughing at me. Toss in the slow realization of my true sexuality, and the disintegration of my parents’ marriage, and you could say my high school years were a private hell. As an only child, I was accustomed to entertaining myself. It was easier to shut down, stay in my room, and fantasize about being someone else, somewhere else. Rather than being physically attracted to the jocks and popular boys in my class, I just wanted to have their beautiful clear skin, their athletic bodies, their fun friends, their self-assured smiles. Oh sure, I convinced myself I didn’t care that I wasn’t popular. But I did. A great deal. It ate me up inside, every day. I felt helpless to do anything about it. Important to note - whatever classmates may have thought of me privately, I was never bullied or teased, at least not that I recall. My turmoil was the result of issues having nothing to do with classmates or teachers, unlike Hannah's in “13 Reasons Why”. Two things saved my high school years from being a total disaster. First, I became involved in drama class and the annual school plays and musicals. I realized that I had a natural instinct for performing, which was reinforced and encouraged by two very special people - Pat Kautter, my drama teacher (thank you, Pat!!) and the late, great Barbara Barden, who directed our musicals. Pat gave me tools to continue exploring my path in acting, and Barbara showed a strong and genuine belief in my talent. I had something positive to focus on, and this was a great boost to my self-confidence. Finally, a place I felt I could fit in and express myself - a lifeline. The second major plus was taking a part-time job in a grocery store when I turned 16. I made new friends (including my senior prom date and #1 fan forever and always, Melissa), and was able to prove myself quickly and earn promotions. It became easier to push my anxieties to the corners of my mind while I was working, or rehearsing for a show. Once I fell in love with acting, all I cared about was finishing school, gaining experience as an actor, and moving to New York City. And so I did. I was not personally suicidal during these challenging years. I didn’t experience a traumatic incident at school - well, not counting some moments with our hellish music teacher in senior year, but that’s another story! A close friend of mine, however, attempted suicide back then, and was thankfully unsuccessful. I felt a tremendous amount of guilt for not seeing the signs leading to that day. I learned another classmate did commit suicide, shortly after graduation. I was lucky. I eventually got professional help for my struggles, a couple of years after high school. I desperately needed it, more than I consciously knew. All these years later, understanding how fragile a teenager’s developing mind truly is, I wish I’d had more compassion for others then. I wish I’d been kinder at times, less judgmental, less cynical. I’ve learned how a simple warm exchange with someone can completely improve their mood, their outlook, give them hope. And maybe that exchange happens when they need it the most. I stayed in touch with very few classmates after graduation, and had no interest in thinking about those times for many years. But time heals. And who knew Facebook would eventually change the world?? It’s been fun to “friend” some of them, and see how they’re doing. I find it comforting and encouraging to see their photos, their smiling faces, their successes. I’m also impressed they found me, since my name wasn’t Colby Ryan in high school! (Ahhhh, you’ll have to wait till my People magazine interview to get the scoop on that one, folks…..). We’ve all come a long way, and I’m aware that the students I wanted to trade places with were going through their own personal challenges and some may have felt as bad, or worse, than I did. Others have experienced tragedy in the years that followed. Some are going through hell right now. “13 Reasons Why” has struck a chord, a deep chord, and it’s no fluke. Many of us can relate to Hannah in some way. My wish is that we all strive to be empathetic and respectful to others, especially those whose lives and experiences are markedly different from our own. That parents and families instill these values in their children at an early age, and actively practice them in full view at home. That they emphasize no individual’s humanity or belief system is superior to another’s. That there is no best gender, best religion, best race, best sexual orientation or identity. That you must think before you speak, and mind your business. We have much to learn from each other, and much to share with each other. These are not difficult messages to understand in theory, but clearly they present enormous obstacles in practice for many.